Removable appliances are fabricated for patients that are missing many or all of their teeth. Patients can take these restorations in and out of their mouths. Dentures are made when there are no teeth remaining. A beautiful smile and the ability to chew can be regained as the denture is retained by the arch of bone, soft tissue, and saliva. Over time the bone shrinks and a reline maybe needed to improve the fit of the denture. Partial dentures anchor on any remaining teeth to restore missing teeth. 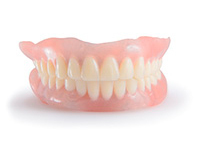 Dentures and partials are an affordable option for patients looking to regain their smile.